Most of our public performances take place each spring during the National Cherry Blossom Festival. We perform every July at the Obon Festival at Ekoji Buddhist Temple. If you would like to try playing taiko, and see how we train, attend our open house! They take place at Ekoji Buddhist Temple. Please click on the calendar listing below for more details. 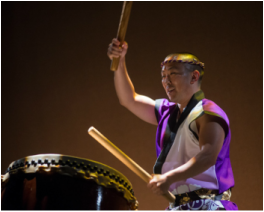 Imagine the drama and intensity of Nen Daiko at your next event! Based at the Ekoji Buddhist Temple in Fairfax Station, Virginia, Nen Daiko performs at events around the Washington DC area year-round. We have been thrilling audiences since 1994. The song Man'in Onrei is a spirited piece thanking the audience for a full house!